Tamil Nadu Chief Minister J. Jayalalithaa has been awarded a 4-year jail term by a Special Court which convicted her in a Rs.66 crore disproportionate asset case this afternoon. Following this, Jayalalithaa, also known as Amma (mother) by her party cadres, is disqualified as a member of Tamil Nadu assembly. After an 18-year court battle, judge John Michael Cunha convicted 66-year old Jayalalithaa, who is general secretary of the AIADMK. 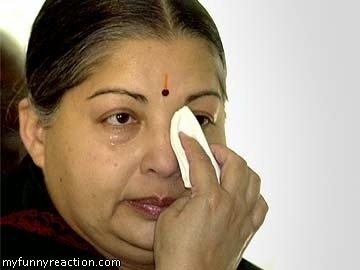 He held Jayalalithaa and three others - Sasikala and her relatives V.N.Sudhakaran and J.Illavarasi guilty. Sasikala is the close aide of Jayalalithaa. Jayalalithaa was charged with acquiring assets worth around Rs.66 crore which is disproportionate to her known sources of income. During her first tenure (1991-1996) as the chief minister, Jayalalithaa had announced that she would take just Rs.1 as her salary. The charge against her was that her assets were around Rs.3 crore in 1991 and had grown to around Rs.66 crore between 1991-1996. The AIADMK was voted out in 1996 as it was perceived to be corrupt.